Albert and Hogan’s Heroes have decided to take a break from touring together after the spring dates of 2015. Albert wishes to spend a little more time nearer home on the other side of the Atlantic and scale back his touring commitments here in Europe. Watch this space regularly though for further Hogan’s Heroes projects, both solo and collective. For the 2015 tour we are pleased to announce that we will be joined by Doña Oxford, who will be replacing Gavin Povey on keyboards. Gavin decided to step down at the end of our recent autumn tour in order to concentrate on various solo projects, so do look out for those. You will find a link to Gavin’s website by clicking on LINKS at the top of this page. While we will miss Gavin’s incredible skills as a player, singer and producer, we are excited at the prospect of touring with Doña. Doña too, is a truly great keyboard player and vocalist. Check out her credits on the BAND link above or by scrolling further down. Albert and the band would like to thank all those who attended Brian's benefit show at The Half Moon on Wednesday 8th October. Thanks too, to all those who performed and of course Carrie Davies for helping us to stage the event. It was a truly memorable evening and much money was raised. Finally thank you to all those who were unable to attend, but kindly donated nevertheless. 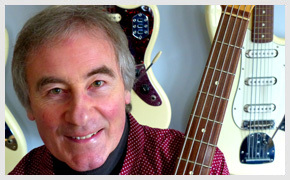 Brian has a background in songwriting and production and his credits include: Sir Paul McCartney, George Harrison, Dave Edmunds, Shakin’ Stevens, Peter Sarstedt, Lonnie Donegan, Neil Innes, Sonny Curtis and Matchbox. This multi-talented band features some of the top musicians in the UK. 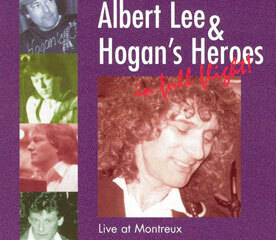 Hogan’s Heroes was formed by its namesake Gerry Hogan almost 30 years ago, specifically to back Albert Lee. The band’s first gig took place in 1987 at Gerry’s annual festival for pedal steel guitar.They have played together on a regular basis since that time and as a result have become one of the tightest units in music. Albert Lee, by common consent one of the world’s finest guitar players, needs no introduction to Country music & Rock fans. 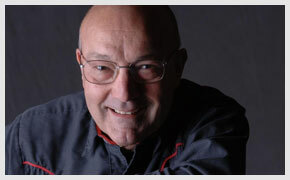 He has worked with some of the world’s top artists, from Emmylou Harris to the Everly Brothers, Dolly Parton to Eric Clapton.In November 2002, at Eric’s request, Albert appeared at the star-studded Memorial Concert for George Harrison at London’s Albert Hall, and was featured alongside Sheryl Crow, Vince Gill and Eric Clapton at Eric’s 2007 Crossroads guitar festival. He is a member of Bill Wyman’s Rhythm Kings, and fronted the band at the O2 arena on the night of the Led Zeppelin reunion concert.Albert is a Grammy award winning musician, whosetalents continue to be in demand by fellow performers throughout the world. Emmylou Harris, Nanci Griffith The Everly Brothers, Dave Edmunds, Wet Wet Wet, Pulp, The Proclaimers, Jimmy Nail, Mott the Hoople and Matchbox. Elkie Brooks, Lulu, Leo Sayer, Huey Lewis, Dave Edmunds, Geno Washington, The Three Degrees, Elaine Page, Sam Brown, The Bay City Rollers and Renaissance. Van Morrison, Levon Helm, Buddy Guy, Gary US Bonds, Leland Sklar, Son Seals, Hubert Sumlin, Bob Weir and Popa Chubby. Morrissey-Mullen, Surface Noise, Surfsuckers, Cayenne and Linda Taylor. Get regular updates on the latest band news and events by clicking on the link below and signing up! needs no introduction to Country Music & Rock fans. Albert fronts his own band Hogan’s Heroes, some of the best known and most respected Rock’n’Roll and Country musicians in Great Britain.Originally formed by steel-guitarist Gerry Hogan to play at his annual festival in 1987 (hence the name! 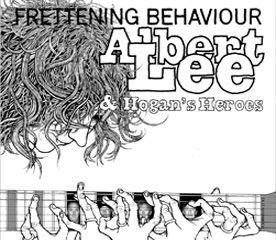 ), Albert Lee & Hogan’s Heroes have relentlessly toured Denmark, Norway, Sweden, Belgium, Holland, Italy, France, Germany, Switzerland, not to mention Finland, Estonia, the Czech Republic, and Yugoslavia, plus of course Ireland and the UK.In April 1988 they starred at the 20th International Festival of Country Music at Wembley and at associated Country Festivals in Munich and Zurich. 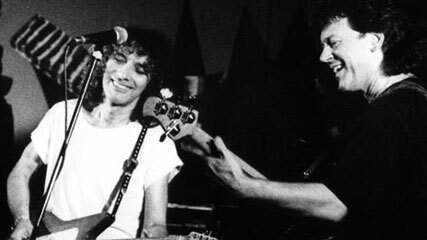 In June 1992 the band played Glastonbury Festival, the prestigious BBC 1 American Festival held at the Crystal Palace Bowl alongside good friends Little Village and Emmylou Harris. They also appeared that year at the Montreux Jazz Festival, where their performance received worldwide TV and radio coverage. An appearance at The Prince’s Trust Concert at Wembley on the “Night of 100 Guitars” featured as special guest their good friend Dave Edmunds. The band even headlined The Yilas Jazz & Blues Festival in Lapland! They continue to work the festival circuit, in 1999 appearing both at Mad About Guitars (music live ’99) and at The Wirral Guitar Festival. In May 2000 the band headlined Martin Taylor's Kirkmichael International Guitar Festival. Coming right up to date, they went down a storm at Cropredy 2003, Fairport Convention’s annual festival, receiving much acclaim from audience and fellow artistes alike. Also in 2003, Albert and the guys received a great response at the Stroud Fringe Festival (UK) and The Nidaros Blues Festival in Trondheim, Norway, exciting audiences in their usual manner.The band has also made many TV appearances all over Europe, including Live from Wembley (BBC), Town & Country (ITV), Later with Jools Holland (BBC), Kenny Live (RTE Ireland), Kelly Live (N. Ireland), In Concert (Yugoslavia), Ohne Filter (Germany), Go Kvall (Sweden) and the British Country Music Awards with Marty Stuart (BBC). They have two albums currently available on Heroic Records, "Live at Montreux", and the latest red-hot studio album "Tear It Up", which emphatically does what it says on the tin! 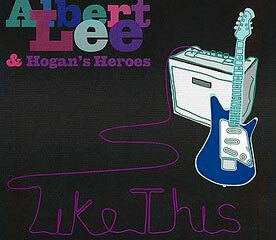 Albert Lee & Hogan’s Heroes additionally have to their credit two songs in the Richard Harris film 'Savage Hearts', which received wide acclaim at the Cannes International Film Festival. The band is renowned for attracting celebrities from the world of music to their gigs, each member of the band being well known and respected for their involvement in the music industry. Star names such as Willie Nelson, Eric Clapton, Don Everly, Lonnie Donegan, Chris Farlowe, Gary Booker, Marty Wilde, Nancy Griffith, Sonny Curtis and Rodney Crowell have all at one time or another jammed with the band to the sheer delight of both audience and band. Whenever and wherever they appear on stage, the pedigree of the whole group and their rare blend of talent guarantees a magical treat of timeless and powerful music. 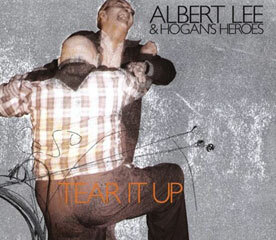 "Few British guitarists have ever shown Albert's innate empathy with Americana and on this latest release, while he lets rip with his trademark exuberant chicken pickin' on rockers like Barnyard Boogie, it's his versatility that's so staggering. Everything, from the smooth Steely Dan croon of Pearl Of The Quarter, to a rough and tumble take of Ray Charles's Leave My Woman Alone, or the Everly Brothers Cryin' In The Rain, is handled with consummate ease and confidence. But then that's what you'd expect from a master." "As a fan of Lee's work for almost two decades, any opportunity to shed some light on one of the greatest of the unknown (or at the very least egregiously unsung) of all "guitar heroes" is an opportunity I'll take. His inherent musicality, impeccable timing and seemingly limitless bag of ideas have left those lucky enough to hear him (even luckier those that have seen him in person) dumbfounded. It's not empty praise, mind you — bear in mind that it was Lee that gave "Slowhand" Clapton a run for his money many times on stage, whether the notoriously self-effacing Brit is willing to admit it or not. At the core of it all is Lee's rare combination of technical skill and sophistication, his ability to spin such creative and musical lines while never resorting to mere showboating. Add to this the tunefulness of nearly everything on Like This, and you've got something resembling a true winner." 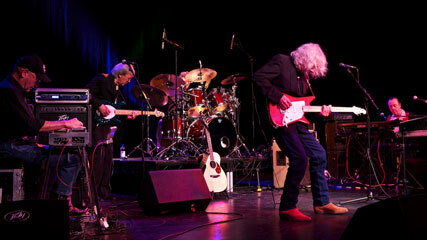 "Those who weren't there missed out big time although when I spoke to Albert Lee afterwards he told me that the band definitely intend to return to Orkney as they really enjoyed it. "The crowd was very enthusiastic and we are very happy to be here", he said as signing CDs afterwards. On Fusion he added: "It's an impressive place. "If I ever get the opportunity see any of these fantastic performers again I wouldn't hesitate to go for it and I suggest that anyone who hasn't experienced this band should get on to it soon!" THE ORCADIAN - "Festival Goes Out On Top"
"Many of the tracks are shot through with a frisky exuberance, their breezily jaunty and uplifting manner occasioned by the practised ease of durable players having a rollicking time. But fond memories of Lee's other activities; particularly his sojourn in the 70s outfit Heads, Hands & Feet; are stirred by the slower, intensely burning excursions, as well as by those taken at a fast-pickin' canter." Find out when and where Albert and the band are touring, and how to book tickets. CDs and DVDs can still be purchased at our online store. 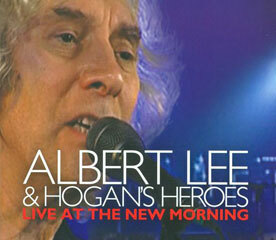 Albert Lee also has his own personal web page. 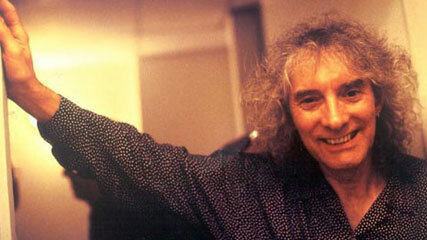 Albert Lee is also a member of the legendary former Rolling Stones bassist Bill Wyman's Rhythm Kings band. Details about the band can be found on this link. 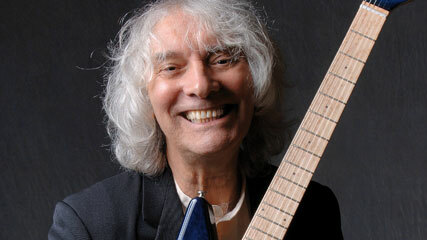 You can also check out and purchase your very own Albert Lee Music Man Guitar. If you just love the sound of Gerry Hogan's Pedal Steel and would like to purchase one, or you would like more information about buying that vintage guitar you have always promised yourself then click the link above. Our very good friend Mike Berry, who co-wrote "GONE TOO LONG" with our very own Brian Hodgson, which is featured on the album "TEAR IT UP", has also a CD out entitled: "KEEP YOUR HANDS TO YOURSELF." Click the link for further details. 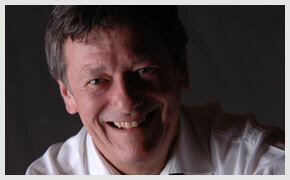 A former member of Hogan's Heroes and great friend of ours Mike Bell has his own website which is well worth a visit. One man we always enjoy working with is Bobby Cochran. 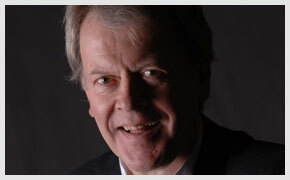 You can find out more about this multi-talented musician by visiting his own personal website. Another website and band worth checking out are our good friends from Sweden, The Refreshments. All the latest information about them can be found by clicking the link. Red Kite Records in Wales, have recently released a compilation CD "Live at the Talbot" featuring live performances at the Talbot in Tregaron. 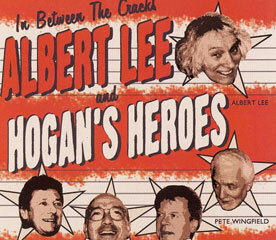 They have also included one track by Albert Lee & Hogan's Heroes on the new CD. For further details of this and other products why not visit their website. Hideout Records is owned and operated by Gavin Povey, based around the Hideout Studio in Ashford Co. Wicklow Ireland, which opened in 2003. Doña is known as the “Goddess of Soul” and “Queen of Boogie Woogie”. Credits include: Van Morrison, Levon Helm, Buddy Guy, Gary US Bonds, Leland Sklar, Son Seals, Hubert Sumlin, Bob Weir and Popa Chubby. 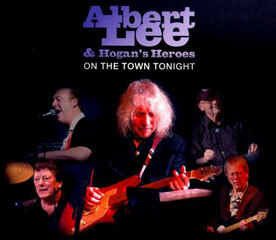 In 2011 Albert Lee & Hogan's Heroes were recorded playing a sellout gig at The Tivoli in Wimborne, rattling through covers of rock and country greats such as Gram Parson's "Wheels", "Oh Darling" by the Beatles, Ray Charles' "Leave My Woman Alone" and Albert's old band Heads Hands & Feets' "Song And Dance". Website designed by J2 design in conjunction with AL&HH. If this website is displaying incorrectly, please update your browser to the latest version - Safari, Firefox and Chrome are recommended browsers. Background photographs © Nick Maroudias. Copyright © 2013 Heroic Records. All Rights Reserved.